in the beauty world we have what we call 'Holy Grail' products. this is the name given to those products that are absolutely amazing and will never steer you wrong. 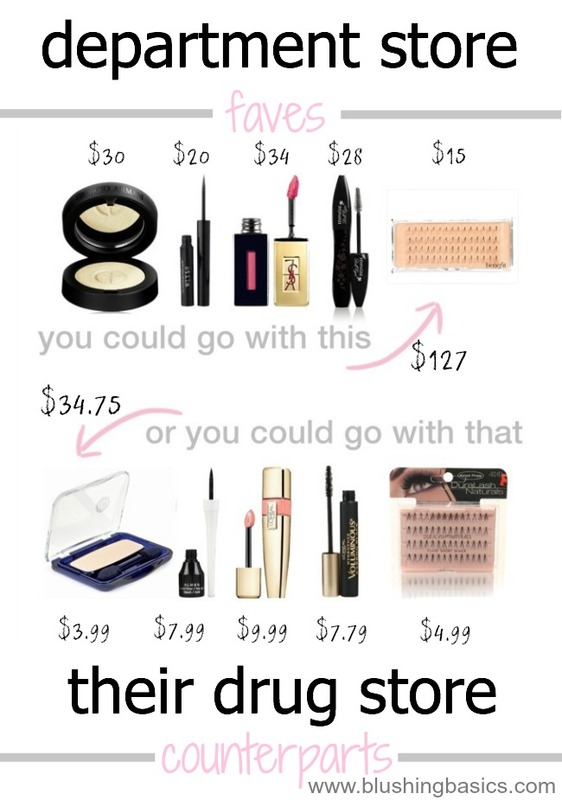 listed above are some of the favorite (read: top-selling) products in their niche and their drugstore counterparts. Giorgio Armani shadows are best known for their weightless, silky smooth application. for $30 a pot they better be amazing and perhaps buy you dinner. i love a good eyeshadow and the occasional splurge is well-worth the investment because shadows last forever, however i don't know if i can justify to the hubs (aka Tman) why our bank account was depleted because mommy needed some new colors. thankfully CoverGirl has your back by offering individual shadows at $3.99* a pot. their eyeshadows may not be weightless and i wouldn't exactly describe it as silky smooth, however the color payoff is great, the blend-ability good and the price can't be beat. my absolute favorite of the bunch is Champagne. if you haven't tried the CoverGirl shadows Champagne is your place to start. one of my most used and oft replaced items is liquid eyeliner. i can't get enough of that product. Stila is widely known as an amazing option for liquid eyeliner. it is a good formula that doesn't run, smear, crease or fade and the applicator is a dream. i consider myself an applicator connoisseur and this is one area where size really matters. the Almay liquid liner is my saving grace. introduced to me by my best friend in 9th grade, this eyeliner is inexpensive, easy to apply and has one of my favorite applicator tips. when you go through it as often as i do, $20 on a department store brand gets a bit steep, however $7.99* is fits just right. YSL Lip Stains hit the market with a vengeance and became an immediate cult fave. these products were flying off the shelves with everyone clamoring for their favorite shade. why? it has the texture of a gloss but the longwear of a stain. basically the dream lip gloss/stain. the downside of this dream product is its price. $34 for a lip stain isn't exactly in the budge. thankfully L'Oreal saw that the demand for this product was high and decided to make a more affordable version for the masses. while not quite as dreamy as the original, the L'Oreal stain works well and is offered at a more manageable price point of $9.99*. Lancome's Mascara is one of the best selling mascaras on the market. its formula boasts that it can sculpt, curl and load every lash. exactly what every woman is looking for. L'Oreal Voluminous has been and always will be my favorite mascara. not only does it sculpt, curl and load every lash, it does it for less than half the price. honestly, i do not buy department store mascara because i have yet to find one that i love as much as i love the Voluminous. how about the price? $7.79* and it is worth every penny. to put it plainly, there is no real difference. go for the less expensive option - Ardell Lashes $4.99*.